HAVERHILL, Mass. — Three-year-old Yiandry Hennriques, diagnosed with brain cancer last Spring, arrived at Haverhill Police Station Thursday afternoon via police motorcade with sirens blaring and an honor guard waiting. 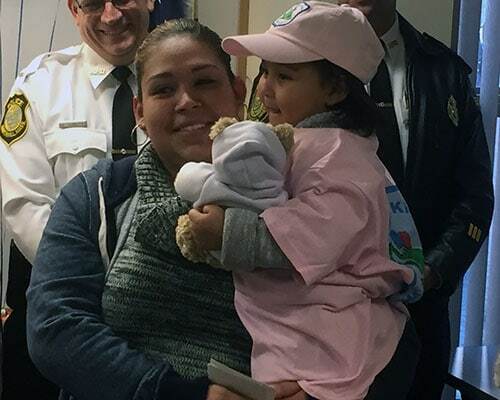 At a special reception, the Haverhill girl and her mother Maria Vazquez received a $5,000 check from Braintree-based Cops for Kids with Cancer, $1,000 from the Haverhill Police Superior Officers Union and $500 from Haverhill Police Patrolman’s Association. Edward J. McNelley, a retired Boston police captain and a Cops for Kids with Cancer director, explained the motivation. The girl, who turns four Feb. 21, was nominated for help by a family friend who called the Jimmy Fund. Since its inception in 2002, Cops for Kids with Cancer has donated $2.5 million to families with children stricken with cancer. McNelley said the group gives $5,000 each to six families a month. Haverhill Police Captain Stephen Doherty said local officers also wanted to help. Yiandry is being treated at Dana Farber Cancer Institute. Her mother, a single parent, said she had to leave her job because her daughter couldn’t walk during the early stages of medical care. Cops for Kids with Cancer was founded when Boston Police Captain John Dow—himself a cancer survivor—observed the struggles facing families with children receiving cancer treatment, McNelly said. He was joined for the ceremony by Stacey J. Abato, vice president of the organization; Miller Thomas, a board member and retired Boston police detective; and Stephen DaCorta, a board member and retired Boston police sergeant. 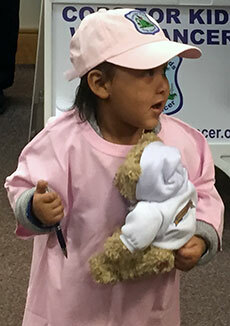 Yiandry was presented with balloons and toured various police vehicles. She seemed to like the sirens best.